This was the dilemma that the McGill Iron Chef team confronted at the McGill-founded 2019 Inter-University Iron Chef Competition on Saturday, February 23. 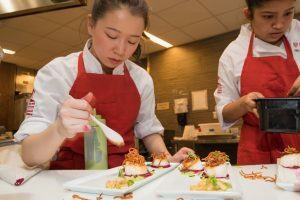 First-year students Anna Leung, Flemming Kondrup, Cecile Monnier, and Viva Noronha had two hours to cook and plate these dishes, placing their dishes on the table mere seconds before the timer rang. The food was judged on taste; plating; originality and utilization of ‘mystery basket’ ingredients; and technique, food safety, and sanitation. Out of Carleton University, University of Ottawa, University of Toronto, and host campus University of Massachusetts, McGill cooked their way to third place, a triumph when one considers that they were the youngest competitors present and only began training after February 2, the date of the McGill Iron Chef competition. 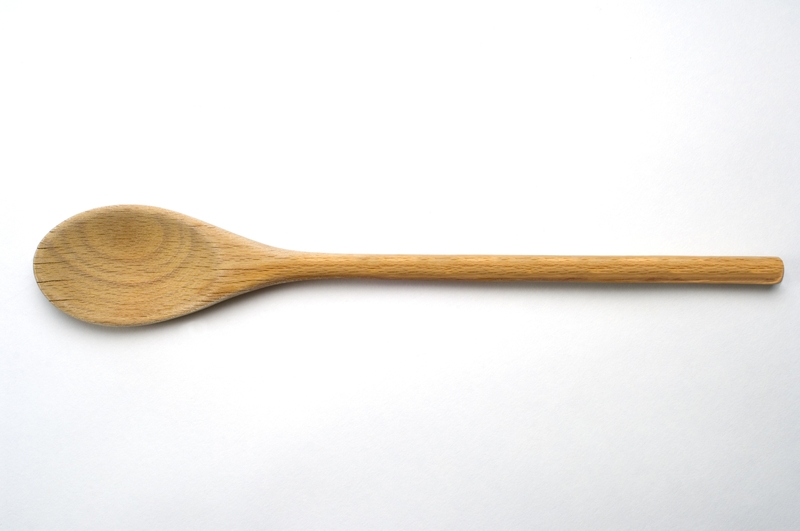 Conversely, some of the other schools’ opponents came from professional cooking and baking backgrounds. 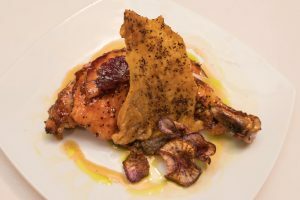 One UMass contender had been in the competition for four consecutive years and had been training all year for the 2019 Iron Chef. Carleton’s cooks were all food science majors. There was even a 26-year-old in the game. Conversely, all four McGill students only held cooking experience in the domestic realm, but they knew how to do flavor. On the first bite, one judge remarked, “Wow- spice!” and Kondrup’s scallop sear won critical acclaim. 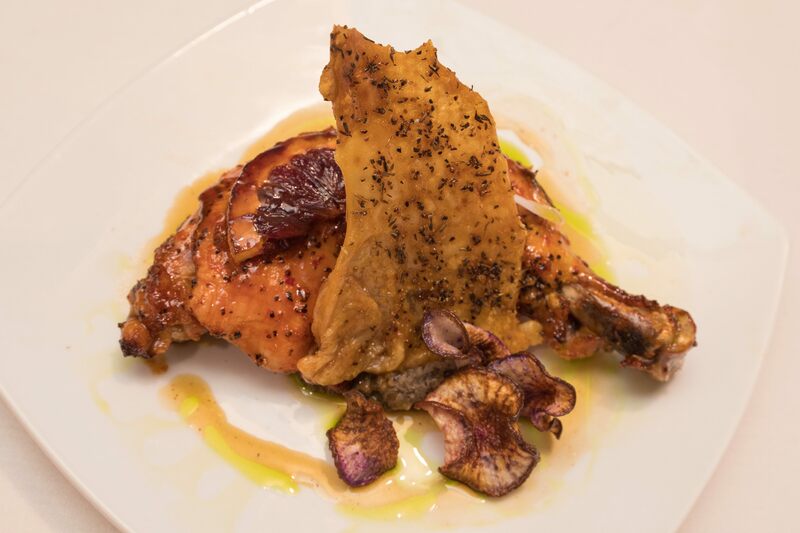 The team’s scientific method for designing stunning, spice-packed dishes was to start with contrasting textures, colorize the plate, then build on flavour profiles. When the mystery box contents were revealed, Leung instinctively knew to create crunch by deep frying the bright orange squash noodles. The plates were presented to the judges in vibrant, sunset shades. On the first bite, one judge remarked, “Wow- spice!” and Kondrup’s scallop sear won critical acclaim. Luckily, Kondrup had just practiced his skillet skills that same morning under the expert training of Chef Zach Suhl, head chef at Bishop Mountain and Douglas Halls. In the few weeks leading up to Inter-University Iron Chef, Suhl refined the amateur cooks’ techniques and abilities to work under the many pressures of the kitchen. He is the one who taught Leung to break down a chicken “like a fricking ninja.” (her teammate’s words, not Zach’s). During the actual competition, however, Zach is quite hands-off; he wanted the competition, the fourth he has coached, to be the students’ chance to showcase their creativity and abilities that he helped hone. Here’s why: Suhl is human, albeit a crazy-talented one with a knack for utter success. He entered his 40s, and his daughters became teenagers. He wanted to focus more on his life as a father and husband, and crazy talent and utter success usually don’t marry well with domestic routines. So, in search of a better balance between work and family, Suhl annulled his restaurant career. When Suhl hung up his stained Laurier apron, he tied-on one with a McGill logo to work in a service he did not know existed until he retired from restaurants. Since, Suhl’s forté in food service, the focal point of Chesterman’s lauding, has transferred into what Suhl calls his new “clientele”: us. The Food Service Department at McGill is self-sustaining, and part of its goal is to bring in revenue for the university. However, Suhl did work in the fine dining industry for some 25 years. He also has two teenage daughters. More than anything, Suhl wants to bring to McGill diners what he brought to Brunoise and Wilfrid diners. To Suhl, the whole goal of working in food service is delivering food that is “current, fresh, real,” no matter the age or budget of the hungry folks. “‘Oh they’re just students, they just want to have mashed potatoes and meat,’” is the exact opposite of Suhl’s view of dining hall customers. And while he sometimes misses the fire of working nights in a kitchen with a team that he himself assembled, students who are passionate about food enliven his current job, especially during Iron Chef season. Suhl stated that this year’s Iron Chef team “Clearly loved food. 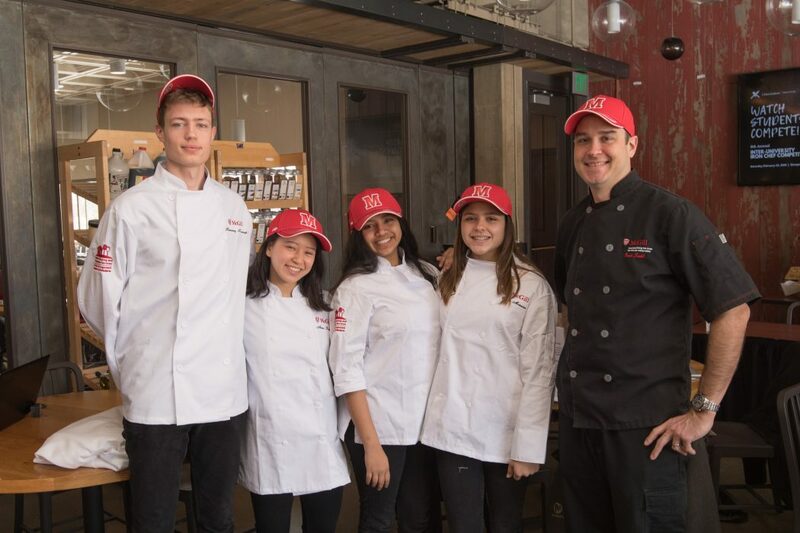 That was the best part about it, seeing how much they love cooking and eating.” In coming years, Suhl sees an additional Iron Chef McGill with the old winners and small cooking classes open to all students. 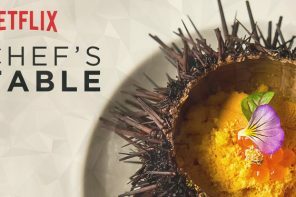 The 2019 Iron Chef competitors are certainly open to another round of cooking. Although McGill prefers to leave Iron Chef spots for fresh cooks each year, the idea of coaching and travelling with their successors excites the group. According to the four, their weekend at UMass exposed them to other young cooks’ styles and methods and, for Monnier, forged friendships across borders. So, to the new Montreal Gazette restaurant critic- keep all your senses on guard for the next best restaurant, a dining hall meets family dinner table meets upscale-casual brasserie meets spice route hybrid; reservations will fill up fast.